My work in digital media led me not only to host “All Girls Garage” on the Velocity network but also act as the show’s script supervisor. I don’t put the tools down when the director yells “cut”! Off-camera you’ll find me regularly working on my own project cars, tackling home improvement projects and hacking the latest gadgets. As a result, I’m able to connect with your audience in an authentic and relatable manner through personal stories, lessons learned, and practical tips and advice not found on any script. Interested in working with a hands-on host? Whether you’re in the research phases of your next show concept or looking to round out your cast, I often work with production companies on-camera and off in a variety of areas from concept creation, writing and storyboarding to casting and production in order to bring out the most compelling stories and showcase the amazing talents of remarkable characters. Interested in collaborating on your next tv show? There are times, of course, when you do have to stick to a script to fit your brand message during a short commercial break. In that case, I do more than just memorize lines. I take the time to understand your audience and brand voice to deliver a message that resonates with both. Writing copy that jumps off the screen yet fits into a tight time constraint is more challenging than you might think! Having developed content for a variety of tv projects, I can help you craft a message that will have the most impact in the time allotted. Interested in working together for your next commercial? Digital is where I got my start. From display ads to responsive, immersive interactive campaigns, I’ve concepted it, designed it, written for it, produced it since I first watched AOL load one pixel at a time while listening to several minutes of DUUUNN beep beep boop boop beep beep EEEEEEEE EEE OWIIIIEE EEEE UHHHH ZIWOWOWEEE CSHHHHHHHHH of dial-up internet. In layman’s terms, I just plain “get” digital. And, when combined with my passion for interactive content, you get Wonder Spawn, a tech-forward media company featuring immersive live 360-degree experiences and real-time social storytelling. Nowhere is the authenticity of your on-camera talent more important than in the digital space. No amount of Jedi mind-trick cinematography will engage your audience if the host him/herself isn’t just as passionate about your story as you are. Because I spend just as much time living internet maker culture as I do building IRL (in real life) my energetic and humorous presentation style appeals to audiences of all ages. 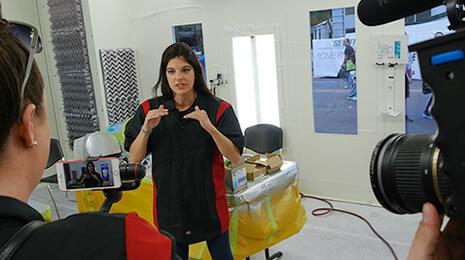 Interested in working with a hands-on presenter? The digital space has as much content as there are stars in the universe so your story has to hyperspace jump past the debris of other programming and viral videos orbiting potential funders and advertisers to gain the visibility and traction necessary to keep producing fantastic episode after fantastic episode. Having produced digital content as my core business for nearly a decade and fine-tuned it using hard metrics, I know how to craft stories where viewers would rather eat the Cheetos crumbs off their shirts than interrupt their binge viewing to grab a snack. Interested in working together on a story? If you are still reading this page, I find your lack of button-clicking disturbing. By now you realize that all your project dilemmas can be solved by using Star Wars references. Join me, and together we could rule the internet.